Extreme weather, mass shootings, Costa Concordia, Rover landing on the moon, not to mention the Diamond Jubilee and London Olympics - 2012 was as dramatic (and operatic) as they come. So what's better than to say goodbye (and perhaps good riddance) to the year with a rousing concert of "opera's greatest hits"? For the fifth year in a row, Bravissimo, a prominent feature of Attila Glatz Concert Productions, brought together five fine soloists, a maestro and a pick-up orchestra for an evening of song. This year we have representatives from Spain, Italy, the UK, Korea, and Canada. Attendance has been improving over the course of the last five years - last evening was a respectable house of around 75%, but it pales in comparison to Glatz's other show on New Year's Day, Salute to Vienna, which was announced as sold out by MC Rick Phillips. The evening started off in a rather low-key fashion, with the overture to The Magic Flute under the spirited conducting of Dallas Opera maestro Graeme Jenkins. Wonderful music of course, but unlike other more flashy overtures it really didn't generate much heat. It didn't help when the audience was sitting on its collective hands in the beginning. Korean tenor Chung's "Dies Bildnis" received only lukewarm reception, ditto Lensky's "Kuda, kuda" - taken at a very brisk tempo by Canadian tenor Gordon Gietz. Canadian baritone Greg Dahl, not heard in Toronto very much these days, made his Roy Thomson debut in Figaro's "Non piut andrai" revealing a warm, robust baritone of attractive quality. Things finally warmed up with Spanish soprano Davinia Rodriguez's melodramatic rendition of Violetta's "Ah fors'e lui...Sempre libera" from La traviata. She has quite an attractive lyric soprano, with a fuller middle and capable of producing the money notes, all the way up to an E-flat. This followed by the Barcarolle from Tales of Hoffmann. By the time of the tenor-baritone duet from Pearl Fishers, the audience was really into the swing of things and gave Gietz and Dahl well deserved generous applause. Unlike last year's concert when there were some major musical glitches under a different maestro whom I won't name here, this time Jenkins had everything under control and conducted with energy and verve. Often these one-off shows don't get sufficient rehearsals, so it it to his credit for leading such a musically creditable performance. The second half opened with two selections from the relatively unfamiliar Beatrice et Benedict. The sparring duet of the two lovers is rarely heard as a set piece in concerts. Gietz and mezzo Annalisa Stroppa sang and acted the piece to the hilt, but there's no getting around the fact that surtitles (or at least translations in the program) were sorely needed. 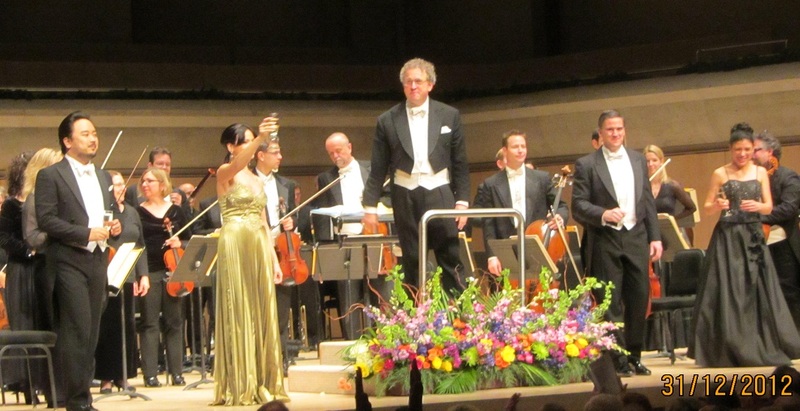 Chung returned for a mellifluous "Una furtiva lagrima", receiving much more applause this time around. Perhaps the biggest surprise of the evening was "Ah! mes amis" from La fille du regiment, sung by Canadian tenor Gordon Gietz. A versatile lyric tenor well known in French, Italian, German, and Czech repertoires and in roles such as Romeo, Duke of Mantua, Don Ottavio, and Don Jose, there has never been any hint that he would tackle Tonio's showstopper complete with nine high C's. Well, his singing was a revelation, with full-throttled high C's, including a final one held for what seemed like an eternity. Gietz received a well deserved ovation. Based on this showing, Mr. Gietz would do well to move into a whole new repertoire currently occupied by the likes of Juan Diego Florez and Lawrence Brownlee! Overall, there was definitely more energy and oomph in the second half, with more crowd-pleasing pieces like Dalilah's Mon Coeur sung with luscious tones - and flailing arms - by Stroppa. Rodriguez returned for a scintillating Jewel Song from Faust, the only thing missing was a genuine trill. Dahl displayed a solid baritone and fine dramatic instincts in Rigoletto's great scena Cortigiani. But it was up to tenor Chung to bring down the house in an exciting if unsubtle rendition of "Nessun dorma." The formal program ended with the quartet from Rigoletto, "Bella figlia dell'amore." By then, the artists had the audience eating out of their collective hands. The single encore, predictably, was "Libiamo, libiamo" from La traviata (as was last year). I vividly recall this was the encore last year as well. The audience wasn't going to go quietly, so maestro Jenkins asked everyone to join in for a rousing rendition of Auld lang syne. Everyone went home happy.